Summer Tips and Trends | Balayage, Lob, Top Knot. The "in" trend for summer 2015 is the Balayaged Lob! 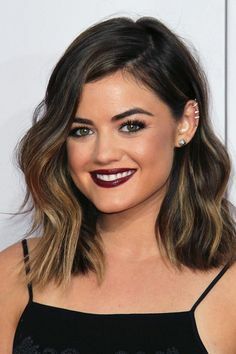 The Lob haircut is a blunt and uniform cut with very little or no layers. Typically it falls somewhere between chin length and the collar bone. Balayage is the art of hair painting. This type of dimensional color provides a more natural sun-kissed look that is perfect for that beach-babe summer style! This look can be done in fine pieces, from the scalp, for a more all-over blonde; or it can be done in thicker chunks and further down the strand for a more ombrè look! This look is perfect for both darker and lighter hair! In this version (from lapetitenoob.com). She shows how to achieve a top-knot without needing a sock or a bun form! Put your hair into a high pony and tease the ends to create lots of volume. wrap the textured ends in one direction around the base of the pony and bobby pin. Lightly rub your fingers on the hair around your face to loosen the shorter pieces for that messy look. *Flat-iron the pieces around your face if they are too crazy! In this version she uses a bun form (or you can use a sock, cut the toe out and roll the sock until it forms a doughnut shape.) Once you put your hair in a high pony, pull the bun-form down to the base of the pony, wrap and pin the hair around the bun form! You can add braids to the top, underneath, side, or a loose one to wrap around the bun for a more "put-together" look! Alright Ladies! Time to get stylin'! We look forward to seeing you soon! All products and tools mentioned are for sale at Sam and Bill's. Please call 919-832-6393 to check for availability, or changes in price!